The adage “To err is human” probably does not apply to the doctors. Doctors are definitely regarded different from rest of the humans and are not supposed to have privileges that other persons of humankind are guaranteed. Hence they are harassed often for any adverse clinical outcome even though it may be because of poor prognosis of patient. They work under continuous fear and stress and are punished for each small or big error. Then what are they? Modern slaves or human docs with robot like activity? With advances in medical science, simultaneously there has been aberrant evolution of medical profession, education, regulation and medical industry. By provoking controversy about doctors for varied reasons, medical industry and law has intruded between the doctor patient relationship to take a centrestage in health care. Till now, doctor patient interaction was the central point of the health industry, a core around which medical industry revolved. Except this interaction, rest almost everything is controlled by industry. If this interaction too is replaced by robotic machines, the control of medical industry over business of health will be almost complete. With the evolution of robotic technology and artificial intelligence, the dream of industry to have full control over health care business has become a realistic possibility. There have been technical advancements to promote better treatment and diagnosis but these, at the same time, increase the cost of treatment and involvement and hence dependence on investors and industry. Complexity of medical science, industry, legalities and medical regulation has been multiplying everyday beyond human limits for doctors, at least in some specialties. Long years of training, Dealing and working with all complexities of medical system, all time retrospective analysis of their work by patients and lawyers, complex documentations, social media mudslinging, extensive and complex communication, technical advancements and legal interactions has taken a toll on the doctors and they are gradually ceasing to be normal human beings. They are slowly being converted to humans with robot like activity. Also there is a thought whether doctors can be replaced by robots, completely or partly. Such talk of having machines is not without basis as all the stakeholders are feeling the need for a drastic change to have better and better medical care . Usually doctors have to carry huge burden of expectation of society and patient. People want quick and effective treatment, without human faults, with an up-to-date medical knowledge delivered within moments. Unrealistic expectations are getting beyond human limits and these can be fulfilled only by robots. Since well trained doctors are lesser in number, they are expected to deliver a curative treatment with excellent accuracy with perfect documentation even when load of patients is extraordinarily high. Even in presence of extraordinary work load and difficult circumstances, doctor are supposed to maintain perfect documentation to save himself. Because later, any case can be subjected to legal scrutiny in future. Lawyers and courts will analyze retrospectively for years, with wisdom of hindsight and luxury of time, to find the faults and may punish the savior. Nobody wants to die. Even somebody with severe disease, with poor prognosis, have tendency to blame doctors for his illness, if he has contacted Such incidences occurring too frequently cause feeling of hurt to doctors. Verbal and physical assaults is a routine. Robots will be immune to such painful thoughts and will not be affected mentally and continue to work perfectly in such circumstances. Training to be a Doctors are expensive and takes years. It takes painful long years and time. Human life span is limited. Therefore training a doctor and paying him life long, a bad business idea for industry and society. That is reason of unwillingness to pay even the rightful to the doctors. Robots will be a onetime investment. Life is one and span is less. Studies and gaining experience takes away good part of doctor’s life. People from strong financial backgrounds avoid becoming doctors. Although they may opt for becoming health managers or investors. Human limitations, like tiredness, mood variation, feeling hurt, family issues, failure to apologize always in all situations (especially if doctor is not at fault), diagnostic bias, limited knowledge are various human factors with doctors, which are undesirable for being a doctor and can be rectified easily with Robots. Available medical information is like a sea, that cannot be held in a hand. However brilliant doctor may be, he will know fraction of available knowledge. The moment we pass our exams, we start becoming out of date. Human bias always plays a role, because medical science is far from complete. Moreover rapid change in technology makes all knowledge and experience of a doctor redundant. Robots can be easily updated. 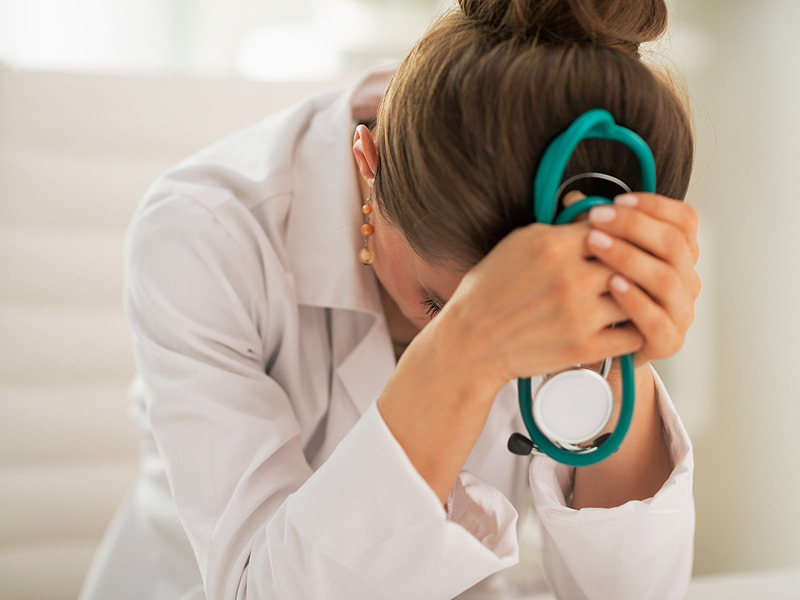 As humans, doctors can make errors, get demoralized or dragged to courts or subjected to verbal or physical abuse, their mood and enthusiasm may be spoiled and may make more errors in other patients as well. But they have to continue to perform as due to nature of their work does not allow them to have time to cool their mind. Repeated incidents make doctors immune to such mudslinging. Their reaction to these insults and distressing situations becomes blunt and reactions are subdued like that of a Robot. Doctors themselves are slowly being converted to Robots like creatures. Doctors do not react to unjustified verbal assaults of a patient, same as machine do. They do not get demoralized easily because of moral assassination by media, calling them thieves, thugs and dacoits, even doing most helpful job in the entire society, saving lives. Now there is no reaction from doctors, when an uncommon or single stray incidence of adverse kind is used to portray all doctors in same light. This unwavering sanity looks like as if there have no apperception to perception of such poignant thoughts, same as Robots. Many of them tirelessly work day and night without rest and food, along with verbal and physical assaults, accomplish arduous tasks like a machine. Medicine is very complex and far from complete, still the precision executed by this wonderful community is no less than great machine “robot”. They executing all theory, practical and experience, application with in a trice. There personal emotions get a machine like toughness. They look like tough ship in such tornado, like a tough machine with no human weakness. There is many things going in a doctor’s life, on professional and personal front. For example, care of sick, difficult family communication, perfect documentation, complaints, ongoing, court cases, declaring deaths, data maintenance, treatment and prevention of infections, nosocomial infections, medico legal suits, iatrogenic complications or simply genuine poor prognostic patients, unforeseen complications, unnecessary mudslinging by media and social media along with newer advances to cope with. There can be personal and own family issues as well. For a simple human being, it is difficult to accomplish all this complexities immaculately and at the same time, while handling the ongoing patient load. Doctors continue to work unaffected by continuous retrospective analysis and afflictive comments from practically every side, patients, administration and courts. All of them acquire wisdom off hindsight and have luxury of time to make an analysis. Robots will be immune from errors and mood swings, tiredness and human limitations, hurt feelings, (will apologize always even if it is not their fault). And therefore legalities in the profession will be minimized. No breach of protocol is possible. No questions or room for mistrust. Robots can do duties all seven days a week and 365 days a year. Public, Governments and medical industry will be happy. With Artificial intelligence and rapid advancement in robotics, doctors will have very little role in medical industry. Best part is that, it will be a onetime investment. Minor disadvantage: Only things Robots lack human touch and feelings and will not be going extra mile for patient as compared to human doctors. Robots will just complete protocols. But with time, these qualities will not be required anymore. There will be no humans to blame for the suffering of diseased, or to vent anger at. No human scapegoat will be there for physical or legal revenge. But till the time human doctors are completely replaced by machine robots, ordinary mortals have to fill in and they will be human Docs with robots like activity (HUDOROLA). Medical Regulation:Is it time to regulate medical business/ administrators of healthcare? “Oxygen cut, 30 children die in Gorakhpur hospital” who is responsible?